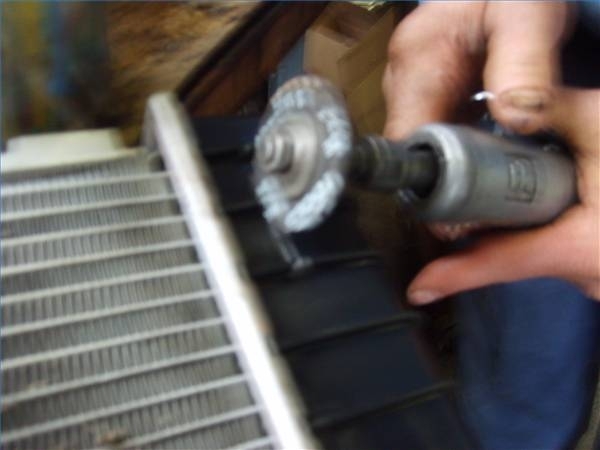 A common failure of plastic and aluminum car radiators is a crack in the plastic tank at either end. 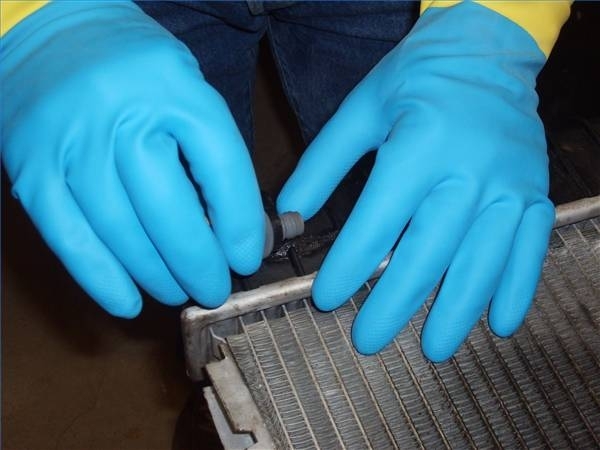 This procedure is for small hairline cracks in the tank which are common in radiators of all makes. It utilizes a super glue type product called Q-Bond which is sold through auto parts and auto body supply houses. All the warnings for cyanoacrylates apply to this product, so please read the instructions carefully. Locate the crack. 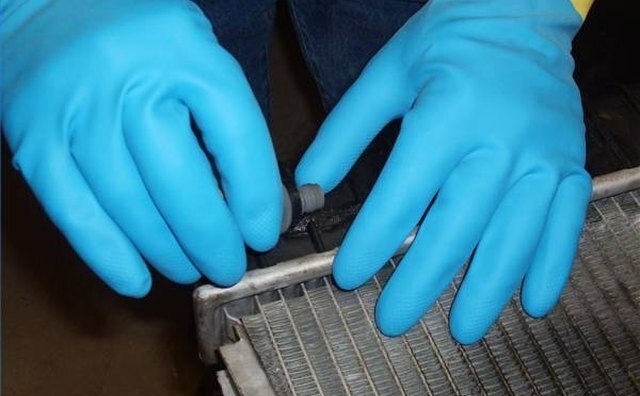 This procedure assumes that you have narrowed down your problem to a crack in a plastic tank of the radiator and removed the radiator from the car. This repair regimen is meant to be performed at a bench or similar flat surface. Inspect the radiator looking for all cracks including hairline ones. You may have to apply pressure with your fingers to confirm your suspicions. Rout, grind or file out the length of the crack. Do not grind so much that you create a hole in the tank. This is very important. You are looking for a trough effect here and the groove you are creating must hold fill material. 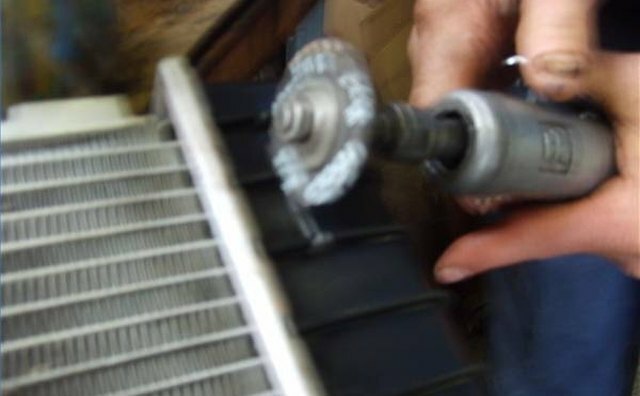 If you puncture the tank completely, you will not have sufficient tank material to hold the fill in place and it will just fall through to the inside of the radiator. Make sure that the repair area is clean and dry. Apply the fill material which is a powder in the groove you created. Drip glue onto the powder, keeping the glue away from the powder so that it does not interact with the tip of the applicator. Although this product is said to cure in 10 seconds, allow it to set for 30 minutes so that the glue has a chance to reach all the fill material. Test the repair. 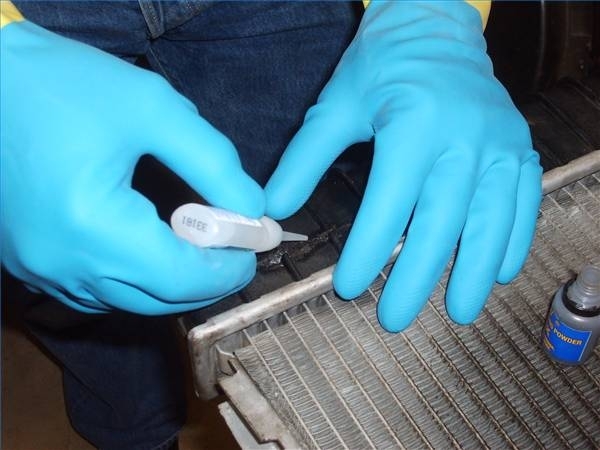 Although you may not have the ability to test your repair under pressure. You can fill the radiator up with water after closing off the necks of the tank you repaired and looking for any drips from the repaired area. Unfortunately, the real test will come after you re-installed the radiator. Use an artist's brush to move the fill material to the crack. Acetone, found in nail polish remover, is helpful in clean up. Be sure to use gloves while handling the adhesive. Be sure to read all the warnings related to the adhesive product.